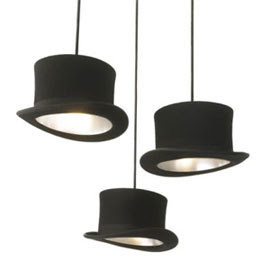 Just to confirm the wondrous conundrum of coincidence, The Guy and I were speculating whether top hats would make a comeback - especially after Johnny Depp wore one in Alice in Wonderland - when from another direction completely, design not fashion, our musings found their answer. Wooster Black/Silver Pendant Lights from Heals. Also available in Jeeves - the ultimate bowler hat at your service. Though a bit odd, I could so see these in a retail environment and be totally cool. I do with the cord was silver or white, it would show off the shape of the hat more. That would be wish instead of with. And...NO, I have not had a margarita yet. It's as if René Magritte designed a light fixture.